1. Place a rack in center of oven and preheat to 450°F. Line a large baking sheet with foil. Toss cauliflower and 2 cups grapes with 1 Tbsp. oil and arrange in a single layer on baking sheet. Roast, stirring occasionally, until grapes are slightly wilted and cauliflower is golden brown and tender, about 25 minutes. 2. Stir 1/2 tsp. salt into a small pan with 1 cup water; bring to a boil over medium-high heat. Stir in quinoa and reduce heat to a simmer. Cover and cook until all liquid is absorbed and quinoa is tender, about 15 minutes. Remove from heat and let stand, covered, for 5 minutes. Transfer to a medium bowl. 3. Halve remaining 1/2 cup grapes and pulse in a food processor with yogurt, curry, cumin, lime juice, remaining 2 tsp. oil, 1/4 tsp. salt and 1/2 tsp. pepper until mixture is slightly chunky. 4. Toss quinoa with 3 Tbsp. dressing and cilantro. 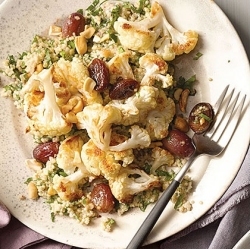 Divide among 4 plates and top with roasted cauliflower, cashews and chicken, if desired. Drizzle with remaining dressing, season with additional salt and pepper, if desired, and serve.